At first sight CouponDownloader may seem like a useful extension that can help you save quite a lot of money. However, we know better than to trust such adware applications, because rather than providing you with useful information, CouponDownloader can actually expose you to a number of potentially corrupted websites. Therefore, it is important that you remove CouponDownloader as soon as possible, because such adware applications should not remain on your computer. If you think that there might be other unwanted applications on board, scan the PC with a licensed antimalware tool for confirmation. The main website for CouponDownloader can be accessed via coupondownloader.com. There is a big “Free Download” button on the site, but unfortunately the direct download link is not working. This allows us to infer that CouponDownloader is distributed via bundled third party software downloads. It would not be surprising, considering that adware applications often employ such distribution tactics. On the other hand, it also means that you install CouponDownloader on your computer yourself, so it is necessary to be cautious during freeware installation, because you can never know what kinds of potentially unwanted and even dangerous applications might enter your system. According to our security research, CouponDownloader is very similar to ScorpionSaver, Suprasavings, SavingsBull and a number of other adware applications that promise to provide you with online shopping coupons and discount offers. It is true that CouponDownloader displays in-text advertisements and shopping offers, but the problem is that we cannot trust it completely. What is more, it does not matter which browser you use – you can still be affected by CouponDownloader, because the application is compatible with Google Chrome, Mozilla Firefox and Internet Explorer. Promotion at the main website claims that CouponDownloader is very easy to install and it offers you thousands of deals. You simply need to click on “View Coupons” to “get a look at some of the offers you can take advantage of with Coupon Downloader”. It would be great if this application could really provide you with reliable shopping offers, but the problem with such adware applications is that they rely on third party adware servers to generate the advertisement content, and so CouponDownloader cannot be held responsible if you accidentally get redirected to an unfamiliar and possibly dangerous website. It means that you have to uninstall CouponDownloader from your computer as soon as possible. It is possible to remove CouponDownloader via Control Panel, but you should also check your browser settings once more, just to make sure that the application was removed completely. Also, a full system scan with SpyHunter free scanner should ensure that no other unwanted applications are installed, and in case there are some, terminate them at once. Select Uninstall a program and remove CouponDownloader. Go to Uninstall a program and remove CouponDownloader. Open Add or remove programs and uninstall CouponDownloader. 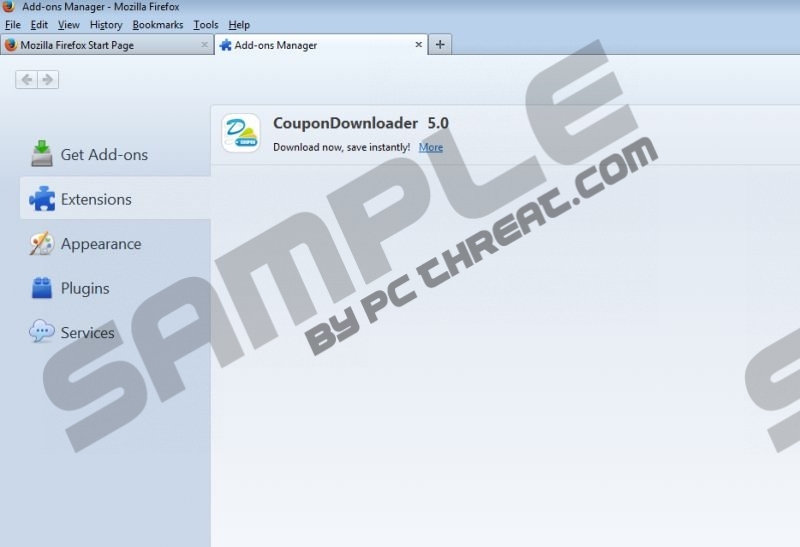 Remove CouponDownloader from Toolbars and Extensions. Remove CouponDownloader from Extensions and restart browser. Go to Extensions and remove CouponDownloader from the list. Quick & tested solution for CouponDownloader removal.